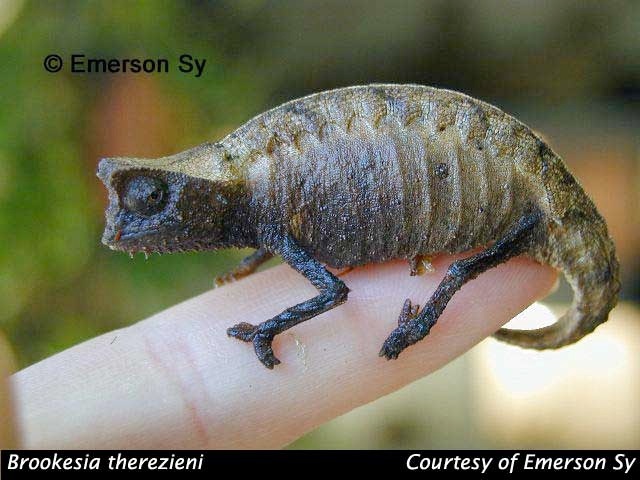 It was nearly eight years ago when I had my first encounter with the tiny forest floor dwelling chameleons of the genus Brookesia. I dragged my father with me on an hour-long drive through one of El Nino's many torrents of the year to view a Madagascar shipment that had arrived the night before. 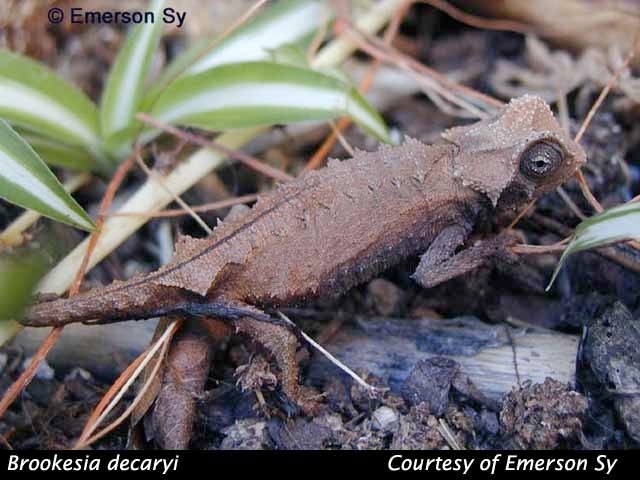 While my father wandered around looking at the more colorful and familiar Malagasy chameleons, I was diligently sifting through bins of dead leaves. My father peered over my shoulder wondering why I wasn't looking for chameleons, and I assured him that I was by showing him a 2-inch long B. superciliaris. He was less then dazzled by this little chameleon and his response was something like "But those are little and brown. What about those panther chameleons?" Despite my Dad's confusion I left that day with a pair of B. superciliaris and B. thieli, and was soon hooked on these often-overlooked little chameleons. Although not as flashy or large as their arboreal counterparts, Brookesia can make tolerant and rewarding subjects for the home terrarium. What they lack in color and size they make up for in sheer weirdness. Clad in an assortment of spines, plates, and other strange projections they are truly unique among chameleons. What they do share with their larger cousins is their ability to disappear into their habitat. Their warm earthy coloration and unusual body shapes provide the perfect camouflage for the forest undergrowth. Only the swiveling of their black eyes and the occasional flash of a pink tongue will betray their presence. 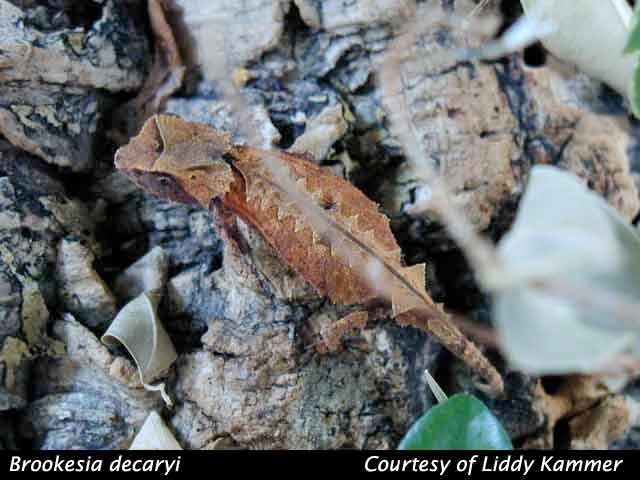 The genus Brookesia is endemic to Madagascar with the majority of the species being found in the northern primary rainforests. The genus is mostly restricted to rainforest from sea level to about 2000 meters in elevation (Raxworthy, 1995). A few species are also known from dry deciduous forests in the south and western regions of the island. These more arid adapted species include B. bonsi, B. decaryi, B. brygooi, B. perarmata, and B. stumpffi (Raxworthy, 543). The arid adapted species that I've worked with seem to be among the most tolerant and hardy species in captivity. 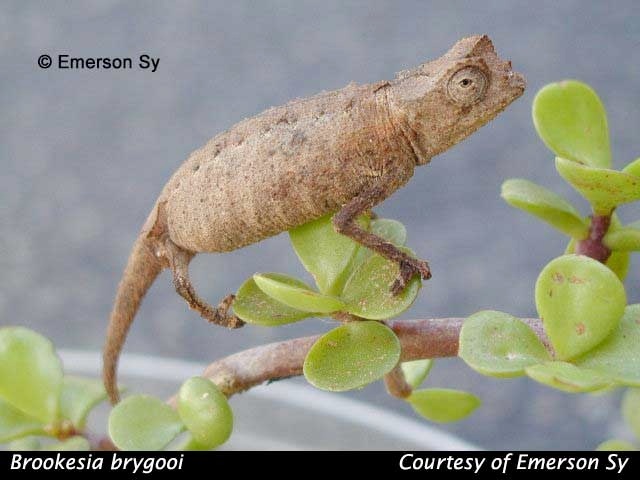 During dry periods Brookesia will enter a state of torpor called aestivation, where they will retreat under debris and wait for rainy conditions. Some species have been known to dig small burrows in loose soil during aestivation (Don Wells, personal communication). 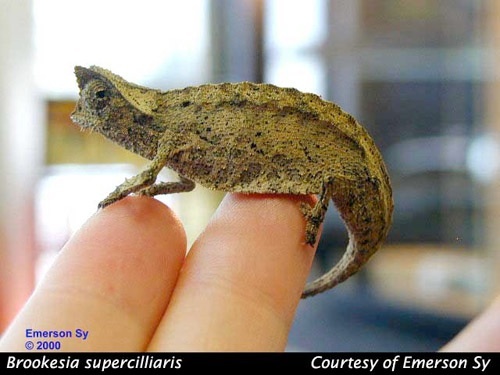 Over the years Brookesia have become fairly common sites in the captive reptile trade and can often be found mixed together in bins at reptile dealers. Several species come into the trade and commonly encountered species include B. stumpffi, B. superciliaris, B. thieli, and B. perarmata. Identifying specimens can be a frustrating experience as these lizards are quite similar to each other and are often mislabeled by dealers. The serious chameleon keeper will want to know with accuracy what species he/she is working with, and for this reason I have included a dichotomous key to the genus as found in Raxworthy and Nussbaum (1995). This key should be quite useful to the chameleon keeper since it exclusively uses external features rather then internal characters such as hemipenal structure. There have been some taxonomic changes since 1995 so this key is meant as a good starting point, if confusion is encountered more recent information may be needed. For example this key synonymizes several species of the minima group into just two species (B. minima and B. dentata), there is still some debate about the validity of these synonyms. Stump-tailed chameleons are fairly simple animals to keep provided that their basic requirements are met. 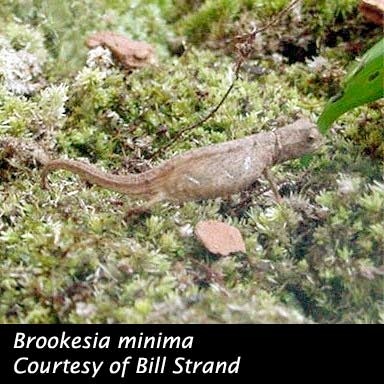 Most species of Brookesia thrive in terraria of moderate temperature and high humidity. The size of the enclosure depends on the size and number of chameleons you plan to keep. A standard 10 gal aquarium is a good size for a pair or trio of smaller species while a 15- 20 gal long is good for a pair of medium to large species. Although they tend to show little aggression towards each other care should be taken not to crowd them. Enclosures can be as simple or as elaborate as the keeper wishes to make them. The most basic enclosure should contain a 1- 2-inch layer of moist potting soil with some dead leaves and a network of twigs for the animals to climb. Stump-tailed chameleons will usually select perches off the ground to sleep and will spend most of the day on the ground. For this reason it is recommended to select enclosures with more floor space rather than tall narrow enclosures. Lighting can be provided with full spectrum fluorescent plant or reptile bulbs. A small wattage basking light can be used to gently warm one area of the enclosure; this warmer area will sometimes be selected for egg laying. The lights should be on a timer with a photoperiod of about 12-14hr days. Highland species should be kept at temperatures in the low to mid seventies while lowland and dry forest species will do well from the mid 70's F to Low 80's F. Temperatures should be allowed to drop at night, which will typically happen anyway when all the lights go out. I find that the average reptile room is plenty warm enough to house most Brookesia with little or no supplemental heat. Although these chameleons are quite tolerant of fluctuating conditions, as a general rule they do not tolerate hot conditions so care should be taken to avoid temperatures above 85F for extended periods. 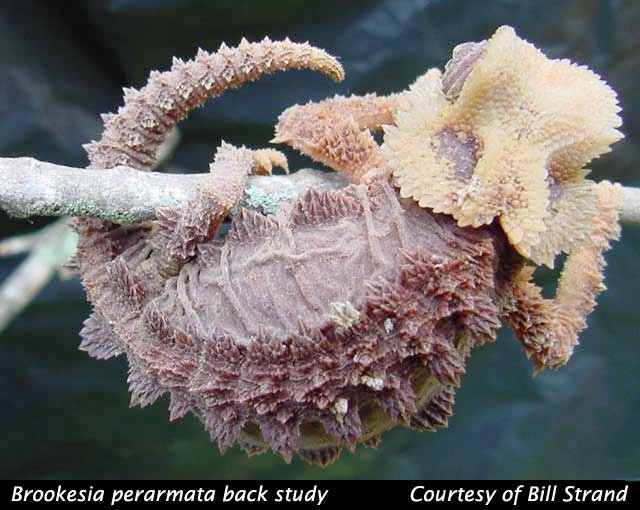 Although lowland species (i.e., B. stumpfi, B. decaryi, and B. perarmata) do tolerate higher temperatures they will all do well at more moderate temperatures. 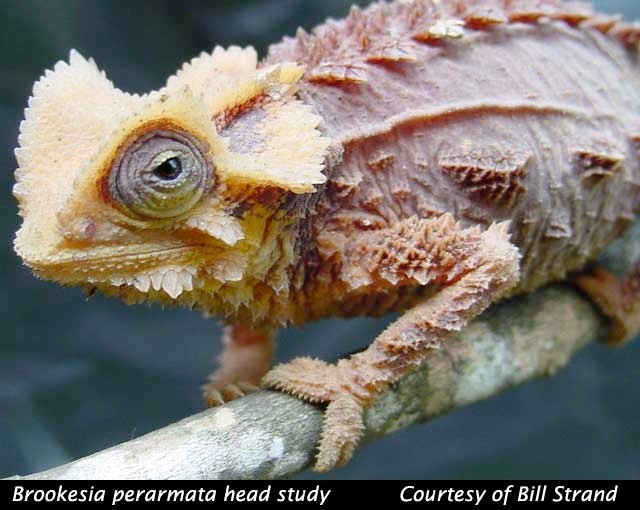 Brookesia are humidity-loving chameleons and their cage should be misted regularly to maintain high humidity, live plants will also help to keep the humidity high. Mist the cage once or twice a day to keep the substrate moist and to provide drinking water. The cage should be well ventilated so that conditions don't become too stagnant and soggy. 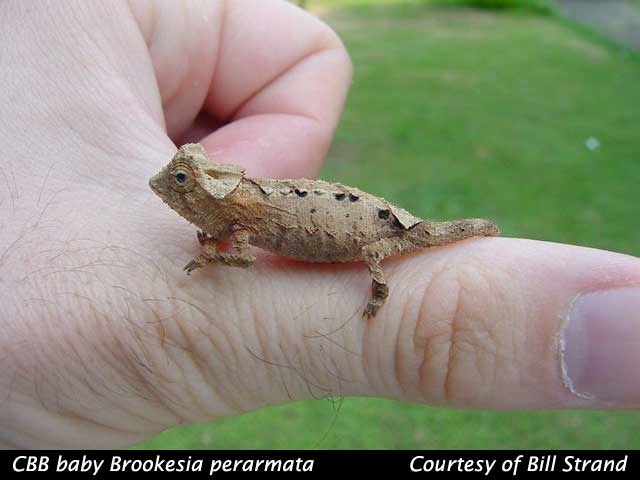 Brookesia can also be maintained in outdoor enclosures in areas that do not freeze. Screen enclosures work well for this purpose but I prefer livestock watering tanks, or similar large bins. If you do decide to house Brookesia outdoors select an area where there will always be some shade for these undergrowth dwelling animals. The use of an outdoor misting system is also recommended, especially in hot dry climates. Although Brookesia will thrive in fairly simple terrariums, they truly come into their own in naturalistic vivaria. 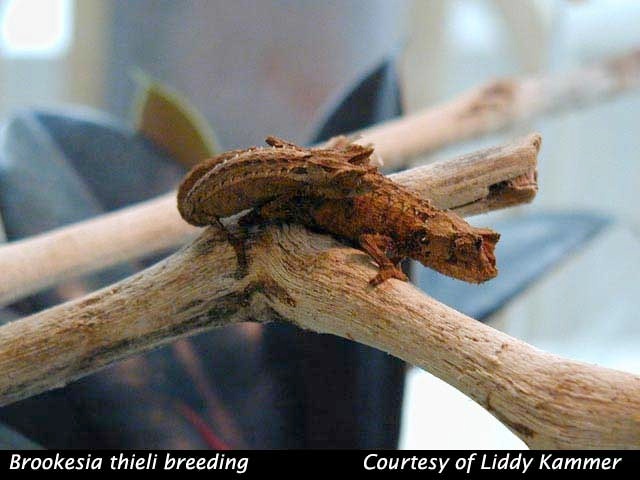 Naturalistic vivaria have been popular in Europe for years and are gaining support in the U.S. Brookesia seem tailor made for tropical vivaria and can make highly interesting additions. With some work a very natural and peaceful looking Malagasy forest floor environment can take shape in your living room; complete with trickling water, live mosses and plants, and of course a few Brookesia. 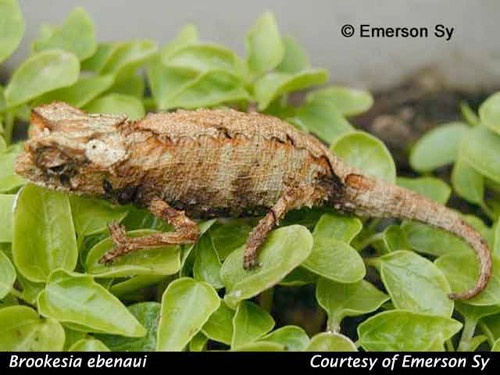 Other Malagasy species with similar requirements can be housed with Brookesia in this sort of vivarium, provided there is sufficient space. Mantellas can add a splash of color, reed frogs (Heterixalis sp.) can add some nighttime activity, rain frogs (Scaphiophryne sp.) 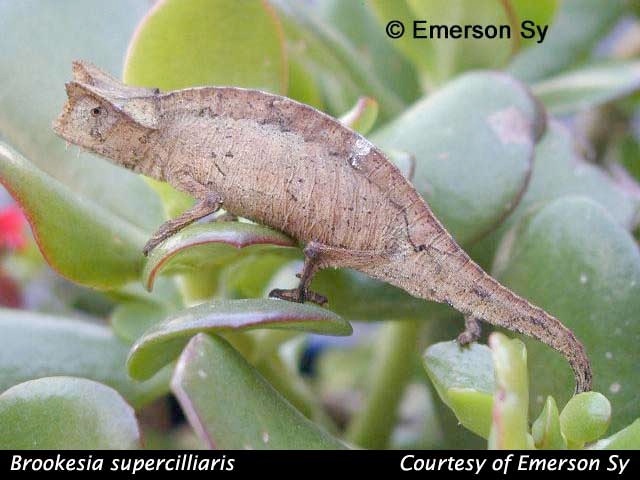 make interesting but seldom seen additions, small Uroplatus and Phelsuma can also be added. The construction of such vivaria is beyond the scope of this article but there are many resources available to get you started in this interesting and rewarding hobby. 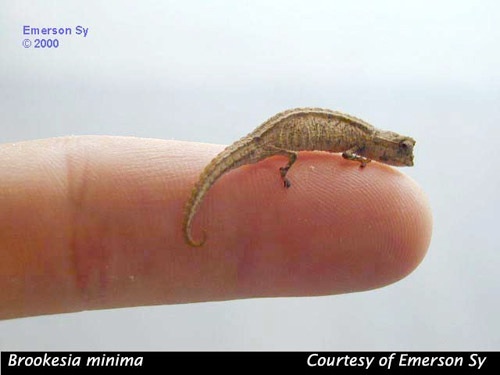 Feeding of Brookesia is fairly straightforward; they will accept virtually any suitably sized insect prey. I always prefer a diet that is as varied as possible for all of my chameleons. I generally include fruit flies, crickets, wax worms, sow bugs, aphids, leafhoppers, and most other suitably sized field collected insects in the diets of my chameleons. Termites are a welcomed part of a Brookesia's menu and are often useful with specimens that are reluctant to feed on other insects. I've also found that specimens that are not feeding on other insects will often accept freshly molted crickets. I've always thought this may be because freshly molted crickets resemble termites in coloration. 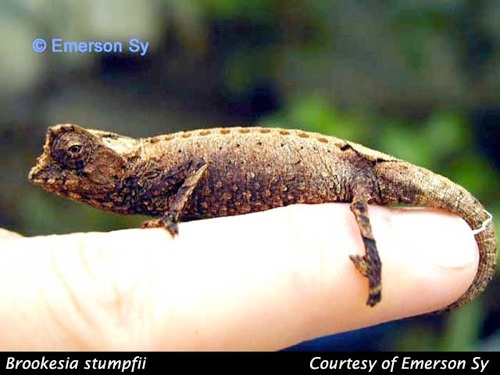 Breeding stump-tailed chameleons is not particularly difficult if the animals are set up and maintained correctly. Sexing specimens can be difficult with many species, so pairing up chameleons may be a frustrating endeavor. 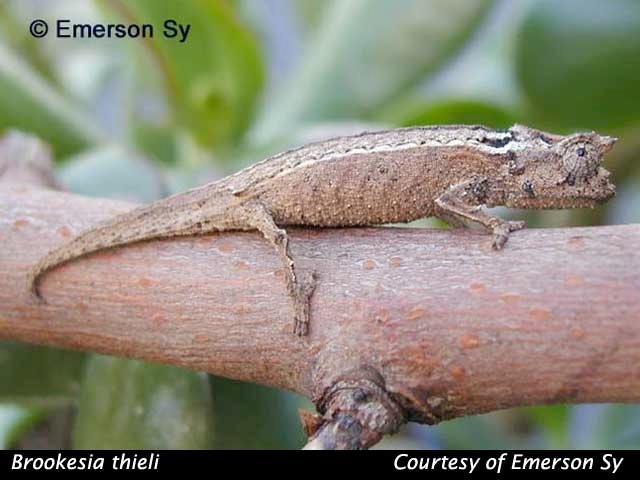 These species lack many of the secondary sexual characteristics of the other genera of chameleons with males and females appearing identical. As a general rule females tend to be a little larger and more robust then males, and some species will have fairly apparent hemipenal bulges. Usually the hemipenal bulges can only be seen in very well hydrated animals and it helps to have several animals with which you can compare. In the wild breeding occurs during the rainy season and in captivity I've noticed that an increase in humidity and especially the use of a rain chamber or sprinkler system will often trigger breeding behavior with some species. This has proved to be particularly useful for the arid adapted species. Other species seem to breed with no manipulation from the keeper other then keeping them well fed and hydrated. Females will usually lay their eggs in a hidden spot in the terrarium, or sometimes burry them slightly. In my experience eggs that are laid in exposed areas (on top of leaves and branches) are always infertile, or fail to hatch for other reasons. 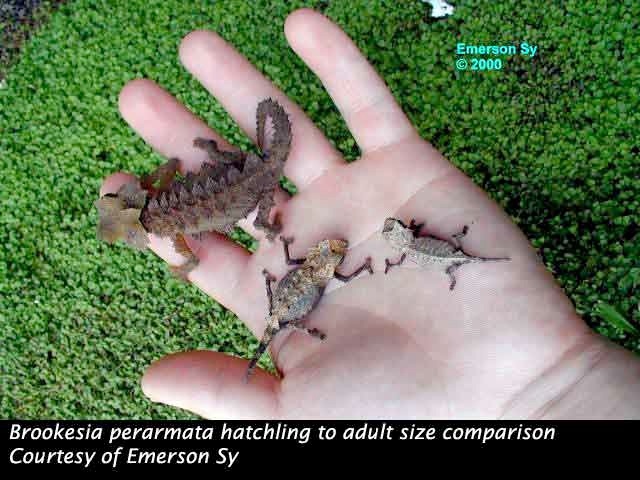 Brookesia lay small clutches of large (compared to the parent) eggs, clutch size usually varies from 1-6 eggs depending on the size and species of the female. Eggs will generally hatch in 4-9 weeks depending on the species and the conditions the eggs are exposed to. Eggs can be incubated in moist vermiculite or sphagnum moss at room temperature (68-75F), but I have had mixed success with artificial incubation. I've been more successful using sphagnum moss as a medium then vermiculite. Generally I find that I get a far better hatch rate if the eggs are left in the terrarium just as the female laid them. It seems that the females have a much better idea of what their eggs need then we do. I now only attempt to incubate eggs if I find them in the process of tearing down a terrarium. This is good news for those using elaborate naturalistic enclosures since the likelihood of finding well-hidden eggs is not good, and you don't have to worry about sifting through the cage looking for eggs. In vivariums with sufficient small food, hatchlings may grow for months before the keeper even knows they are there. Rearing of offspring is the same as for adults although they are more sensitive to dry conditions then the adults are. Hatchlings should be supplied with large quantities of small prey items such as fruit flies, aphids, and hatchling crickets. For small species such as B. minima you will need to find even smaller food sources such as springtails. Springtails can be cultured in plastic containers or can be introduced and cultured directly in a vivarium. The vivarium will need an area of wet substrate with small puddles, fish flake can then be added to the small puddles or wet substrate. The springtails will feed on the fish flake and any other organic detritus including fungus. Once established in the vivarium the springtails should always be available for any hatchlings that may emerge. For more information on culturing springtails and other minute insects check out www.edsflymeatinc.com. 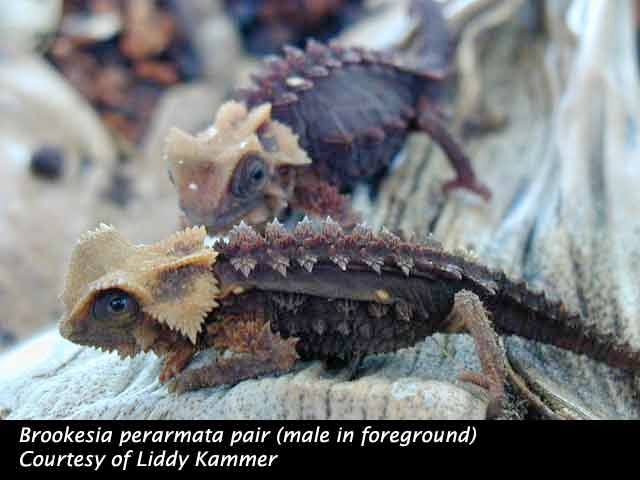 Though not as flashy or colorful as many of the larger chameleons, the hardy and bizarre Brookesia can make very interesting additions to anyone's chameleon collection. Their suitability for small indoor vivariums can make them excellent choices for those keepers who are short of space or for the accomplished vivarium builder looking for something new to work with. It is my hope that more chameleon keepers will dedicate some of their time and space to Madagascar's living leaves so that we will continue to learn more about their maintenance and breeding in captivity.